We are successfully operating as a Plastic Toys Manufacturer, Exporter and Supplier in Canada. Right from wagons, small trucks and to building blocks and even to images as shown in photography, we can produce all kinds of Plastic Toys. And as we know the Plastic Toys are ultimately meant for kids, we carefully choose only the harmless raw material i.e. Plastic Resins. We manufacture unique and visually appealing range of colourful toys which the kids get automatically attracted to. 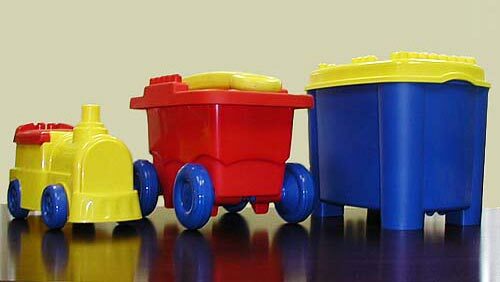 We use both hard and soft plastic to make the Plastic Toys. Compared to other Plastic Toys Manufacturers in Canada, we offer these toys at attractive prices. They can also be acquired in desired specifications from us. Plasti-World Products Ltd has over 37 years of experience in the plastic moulding industry. We have been manufacturing premium quality toys for many famous companies such as Crayola, Barbie, Mega Blocks and Walt Disney. Rest assured that our plastic products are not only innovatively designed, but they are also safe and long-lasting. All Rights Reserved. Plasti-World Products Ltd.